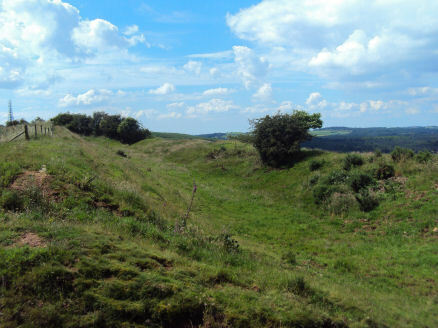 Eddisbury hill fort, known also as Castle Ditch, is an Iron Age hill fort near Delamere Forest. Hill forts are fortified hill-top settlements which were constructed across England during the Iron Age. Eddisbury is the largest and most complex of seven hill forts in Cheshire, occupying a sandstone plateau just to the east of the main ridge of Eddisbury Hill. 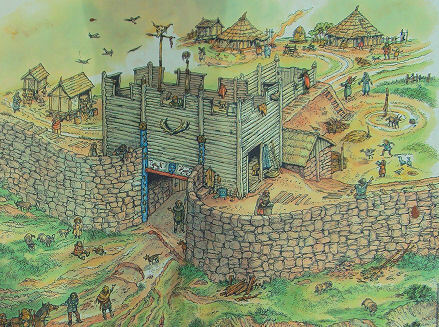 The fort was begun before 200-100 BC and expanded in around 1-50 AD. The Romans slighted the site in 1st century AD. It was occupied again in the 6th-8th centuries, and an Anglo-Saxon burh was probably established at Eddisbury in 914. In the medieval and post-medieval periods quarrying and farming have damaged the site. Ownership is currently split between the Forestry Commission and a local farm. 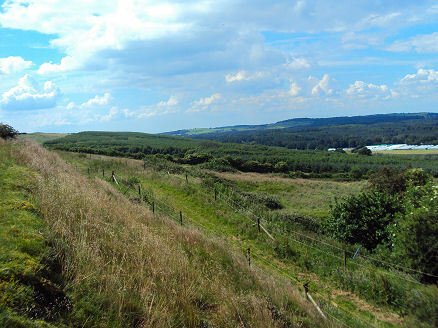 Eddisbury Hillfort follows the contours of its hill and measures 200 by 380 m (660 by 1,250 ft). It is surrounded by two ramparts with a ditch in between. The ditch is 10 m (33 ft) wide and 0.5 m (1.6 ft) deep. The inner bank lies between. The site was excavated between 1935 and 1938 by W. J. Varley, who also undertook excavations at nearby Maiden Castle as part of his investigation into the origin of Cheshire's hill forts. A further archaeological excavation that took place during the summer of 2010. A decorated sandstone boulder dated between the Late Neolithic and the Late Bronze Age was recently discovered at the site. The boulder was recovered from an excavation within the entrance area of the hillfort, one of its surfaces bears multiple cupmarks. A more visible marker was left on the site of the entrance, the east entrance excavation was backfilled and at the same time six large timbers were placed up-right into the front six postholes of the Iron Age entrance in such a way that their tops would still be visible after the backfilling was complete. The surplus stone removed from the 1930’s backfill has been used to build low dry stone walls between the extant timber posts in order to mimic the underlying archaeological remains. 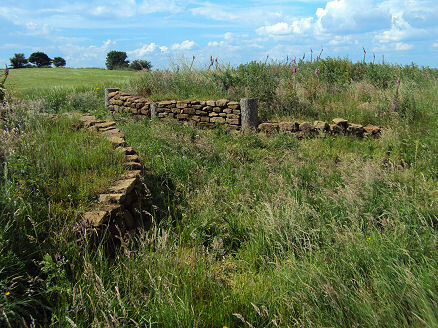 Eddisbury is protected as a Scheduled Ancient Monument.